RA Immunotherapy: What is the Success Rate of Immunotherapy? Many advancements in medical treatments for rheumatoid arthritis have been made over the past two decades. Researchers now feel that rheumatoid arthritis immunotherapy is one of the best methods of preventing the disease’s progression. Immunotherapy and its several formats can essentially stop the patient’s immune system response and limits damage to healthy joint tissue. By preventing the immune system from causing inflammation, immunotherapy helps rheumatoid arthritis patients experience greater periods of disease inactivity or remission. With fewer active states of disease symptoms, rheumatoid arthritis patients can continue to live a high quality of life and experience less chronic pain. With rheumatoid arthritis, the body’s immune system is triggered to attack healthy joint tissue. These attacks produce inflammation and cause chronic pain, joint damage, and other severe symptoms. In an effort to stop the autoimmune attacks from happening in rheumatoid arthritis patients, researchers have developed immunotherapy treatments that protect the body from its own attacks by interrupting the autoimmune responses. Immunotherapy treatments called biologic response modifiers are some of the most effective medications used in preventing immune attacks in rheumatoid arthritis patients. They are one of a type of medication called disease-modifying antirheumatic drugs (DMARDs) and are often effectively used as early as possible in the disease course. Research has shown that the sooner aggressive immunotherapy treatment can begin, the better the outlook will be for the patient. Immunotherapy treatment can prevent the disease from progressing and prevent complications such as loss of joint function and mobility requiring surgery. How Does Rheumatoid Arthritis Immunotherapy Work? Rheumatoid arthritis immunotherapy or biological therapy works by treating or restoring the body’s immune system so that it is able to fight against infection or disease. The immunotherapy drugs take portions of the immune system and treat the contributors to autoimmune disease. In many immunotherapies, biological response modifiers are used which are naturally occurring substances produced by the body in response to infection and disease. Laboratory technology can produce these biological response modifiers and administer them in larger quantities to patients fighting diseases like rheumatoid arthritis. Many biological response modifiers – or biologics as they are often called – target a specific protein called the tumor-necrosis factor (TNF). Biologics that target these proteins are called anti-TNFs. Other biologics target a form of white blood cell called T-cells, which is involved in rheumatoid arthritis inflammation. Then there are biologics that block a protein called interleukin-1, which plays a role in the immune system associated with inflammation. Biologics may take effect at varying lengths of time. Some biologics begin working quickly while others may take weeks or even months to take effect. Response times depend entirely on the individual patient. Depending on the response time, doctors may prescribe other medications in conjunction with the biologics to reduce inflammation and alleviate pain. Rheumatoid arthritis immunotherapy like biological response modifiers is often used when patients experience issues with traditional DMARDs. Traditional DMARDs may not work as expected for all patients and sometimes produce adverse side effects. Because biologics are a newer class of rheumatoid arthritis immunotherapy, often patients will be prescribed traditional DMARDs as soon as possible, and then have it followed by biologic treatments. The majority of rheumatoid arthritis immunotherapy medications are administered to patients through an injection. Injections are made either under the skin or directly into a vein. There are some newer rheumatoid arthritis immunotherapy options available that can be taken orally. One example of this is called tofacitinib citrate, or Xeljanz, by brand name. This immunotherapy drug is known as a JAK inhibitor, which targets a specific enzyme pathway in the immune system in order to interfere with autoimmune attacks. Often times patients will have positive results when taking a certain type of biologic only to have it stop working down the road. In this case, it may be necessary to switch to a different form of rheumatoid arthritis immunotherapy drug. This can be quite common and is all part of the process of finding an appropriate medical treatment strategy. Immunotherapies like biological response modifiers are proven to be highly effective in treating many patients with rheumatoid arthritis. It is important to be aware that like any DMARD, immunotherapies such as biologics do weaken the immune system. This leaves the patient susceptible to infections and so it’s important to be conscious of any signs of illness like fever, chills, nausea, and muscle aches. 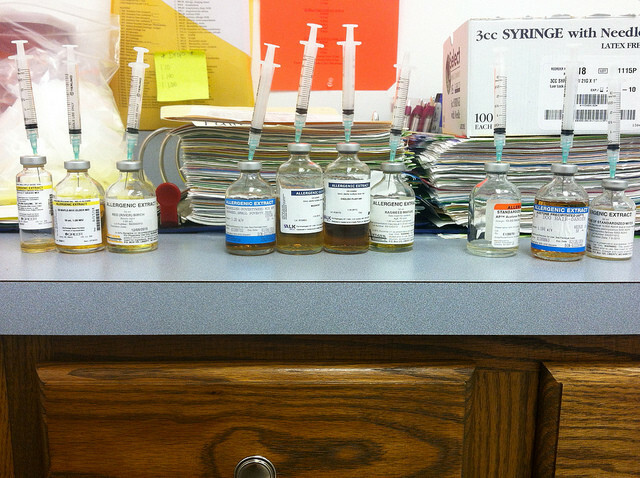 Because biologics are typically administered via injection, it’s also possible for patients to develop skin irritation at the injection site. Side effects depend mainly on the specific patient as well as the forms of biologics being taken. While side effects may be an inconvenience in many cases, the most important aspect of rheumatoid arthritis immunotherapy treatment is to get the disease under control and protect the patient’s overall well-being.